If you live in Asheville or nearby, please stay safe today with the approaching weather system. It looks like a nasty mix of snow and ice are heading our way. How was your weekend? Mine was great, albeit I’ve had my fair share of cold for a long time. I didn’t even leave the house yesterday and honestly I probably will not today either. Yay for a treadmill and working from home. The hubs and I had a nice dinner at home for Valentines day. I had a great time and I hope you did too. I’m not a huge fan of Valentine’s day so I never really make a big deal about it. Is that weird? 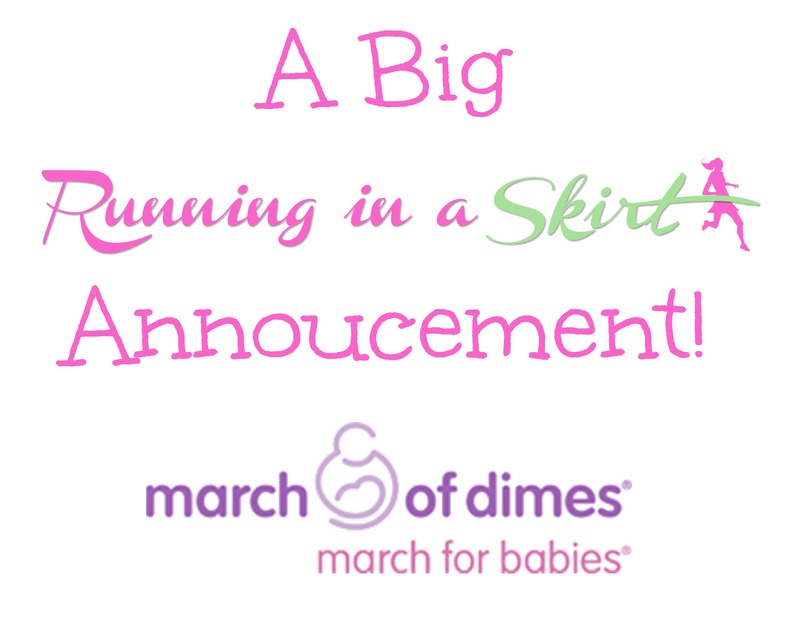 What I am making a big deal about today, is a BIG announcement on Running in a Skirt! I am thrilled to announce that am working with the March of Dimes as the Event Chair for the Asheville area March for Babies 2015. Watch my video below! Eeeeeee a video!!! Finally! March for Dimes is a three mile walk through downtown Asheville on May 16th. The walk supports the March of Dimes and its mission to help woman have healthier babies. Each year more than a half a million babies are born too soon. Some of these premature babies are so small they fit in the palm of your hand. Many fight just to survive and others struggle with life long health problems because of being born premature. The March of Dimes hopes one day every baby will have a chance to be born healthy. With credentials like that, I am beyond honored to work this with amazing, long-standing charity. I really want to help them have a fabulous event this year. Remember there are three ways you can help me with this years walk. If you have any other ideas on ways you can help, want to volunteer or can make a product donation, feel free to e-mail me as well. I will get you in touch with the right people. I also wanted to reach out the to the healthy living blog community. Many of us spend so much time writing about how we try to lead healthy lives and find ways to help others do the same. I feel that March for Dimes shares that mission with us. They help women learn about ways to lead healthy lives before and during pregnancy so babies have a better chance to be born full-term. We are all on the same team because healthier women generally will have healthier babies. I’d love for the blogging community to support me with this endeavor as well! If you aren’t local to Western North Carolina, you can always make a donation and have your own private walk/run the morning of the event. Helping BABIES is a cause we can ALL get behind. I could not think of a better way to launch the video component of Running in a Skirt than this! I know the video is not perfect (I need a better microphone…,) but I don’t think it is terrible for my first try. I am in serious need of a lesson on Adobe Premiere Pro. I’m hoping to make this the first of many videos for Running in a Skirt. And I promise not all of them will be as serious as this one. Thank you guys for hearing me out today! I am so excited to be a part of this years March for Babies. I need your help to make this year’s walk the best yet. Thanks so much Aimee! I really appreciate it! Julie! Your blog updates are always an inspiration to me! Don’t forget our plans to watch the total solar eclipse 08/21/17 across Western North Carolina! Hi there! I also write for RunHaven and see your articles all the time so I wanted to check out your blog! I actually had a college roommate (who I still keep in touch with) that lived on Beech Mountain! It was so beautiful there and it’s where I learned to snowboard many years ago. Hi Allie! Thanks for stopping by today and for you kind words! March of Dimes is such a cool group and I am honored to help them! Hope to see you again here soon! Congrats!! I am a nurse and have spent a lot of time working in the NICU so have lots of experience with preemies. This is a great cause! They do such great things! As part of my “training” I wen to the NICU for an afternoon. A very powerful experience. I really have so much respect for people who do what you do. That’s super exciting! I love when we can put our passion for exercise to a good cause. I have my girls on the run race that same weekend so I will be there with you in spirit. Nice job! Thanks Deborah! I appreciate your support!!! What a great cause! I am lucky to have had two babies born – of their own choosing – exactly on their due date. I have many, many friends who had premature babies and I know the struggle it can bring. Kudos to you for working for this great cause! Thanks so much Cole! I really appreciate your support! Your boys are adorable. How awesome for them and for you for you to be Event Chair for the March for Babies. You’ll be Great !! <3 So many people have been impacted by prematurity. It's crazy! Thanks so much! Congrats Julie, this is awesome! What a great charity to partner with! Thanks Danyelle! They are an amazing group! What a great cause! I know you’ll do a wonderful job working with them! What a wonderful opportunity. They are so lucky to have you! You are too kind! Thanks Jessie! Congrats on being chose to chair such a great event. Stay warm! Congrats on being chosen to chair such a wonderful event! Stay warm! Thanks Meranda! As long as our electricity stay on, I’m good! And you look so great back in front of the camera! Thanks so much for your kind words about the video! I was uber nervous putting it out there. So exciting! COngrats Julie! You will do a fantastic job, and they are lucky to have you! You are too kind! Thanks Susie! I was too! Not small enough to be in an incubator or anything, but I was 5 pounds. I would LOVE for you to join us. I can help you get started or give you more information if you need it! I loved your video. I would love to be able to walk with you,but I am not able due to health problems. I just started a blog and I will put a link to this on my blog. Keep up the wonderful work Julie. Actually, I am going to try my best to walk. I have set up a donation badge on my blog and on facebook. This is awesome Julie!!! I really appreciate you support and can’t wait to meet you. Let me know if you need any additional support to raise money.